We’d love your help. Let us know what’s wrong with this preview of The Keep by Dan Greenberg. Long before the pyramids in Egypt were built, two demi-gods were locked in a struggle to decide the fate of manking. Throughout the centuries, the necromancer Molasar made unholy war against the people of Earth. To sate his evil needs, he was responsible for hundreds of disasters and wars including the Black Death! Then in 1476, the forces of light imprisoned him in THE KEE Long before the pyramids in Egypt were built, two demi-gods were locked in a struggle to decide the fate of manking. Throughout the centuries, the necromancer Molasar made unholy war against the people of Earth. To sate his evil needs, he was responsible for hundreds of disasters and wars including the Black Death! 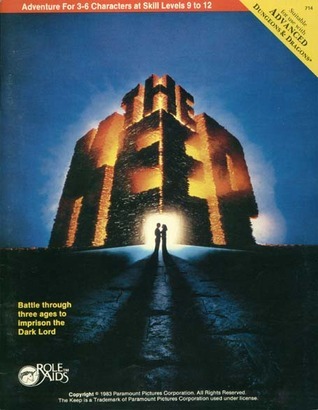 THE KEEP is a faithful and detailed fantasy roleplaying adventure based on the major Paramount Picture's film release of the same name. Published November 1983 by Mayfair Games, Inc. The Keep is a special treat for D&D enthusiasts. It started as a book in 1981, then was made into a movie in 1983 which was quickly followed up by an AD&D adventure put out the same year. The book was great if you don't mind the sudden switch from horror to heroic fantasy. My local movie rental shop didn't have the movie, but the few scenes I could find on YouTube didn't look very good. It looked like a typical over-synthesized, over-atmospheric 80s film, and it clearly changed some thin The Keep is a special treat for D&D enthusiasts. It started as a book in 1981, then was made into a movie in 1983 which was quickly followed up by an AD&D adventure put out the same year. The book was great if you don't mind the sudden switch from horror to heroic fantasy. My local movie rental shop didn't have the movie, but the few scenes I could find on YouTube didn't look very good. It looked like a typical over-synthesized, over-atmospheric 80s film, and it clearly changed some things from the book. The adventure appears to be a mix of both. It turns a story set solely in 1941 into a 3-part time-travelling saga. The first part occurs in the regular time period of the adventurers, in their regular campaign world (a pre-historic Earth, as it turns out). The party's first mission into the Keep is classic D&D; going into a fortress of the undead to steal an artifact and plays the most straightforward of anything in this module. The second part ... well, the second part could either be the greatest battle ever set in an AD&D game or a long, drawn-out slog that just ends up being summarized to save time. Or it could be somewhere in the middle. It is a massive battle, but broken into discreet parts, I think it could just work. Never really know until I try to run this. The second part is the shortest, as the module cleverly explains why Vlad Tepes is called Dracula and is primarily notable for the way the villain tries to trick the party into working for him instead. The third part is the part that follows the action of the book and film, and is I think the most unpredictable, as the presence of the party is a total wildcard thrown into the situation and I honestly can't figure out how it would go. I can assure you it won't follow the script! I'm not one for modules that have a script in the first place, but at least the module notes that the player's actions could change everything. Like the huge battle in the beginning, this too I think may prove hard to run. But at least you get to have the party possibly fight nazi soldiers, and that has to be fun. I'm not sure I like the rules on modern weapons meshed with D&D stats, as it ignores some basic D&D rules like dexterity adjustment. I also think that ruling protection from normal missiles has no effect on bullets is patently unfair when the villain can't be harmed by bullets because they are not magical. So I'd probably want to change some of the mechanics.